While the European Championships — to be held in 2016 in France — are often thought to bring multicultural Europe closer together, the latest edition of Pic of the Week illustrates how that’s not always the case. This week, Serbia and Albania squared off in Belgrade in Group I action in the Serbian capital of Belgrade. As you might recall, the two countries have a long, complicated, and often bloody relationship. Tensions between the two are rooted in the conflict involving the former Serbian-province of Kosovo, where Serbia expelled and ethnic cleansed of Albanians and NATO had to step in to stop the bloodshed. And as such, UEFA banned away fans from traveling to either of the fixtures scheduled between the two national teams. 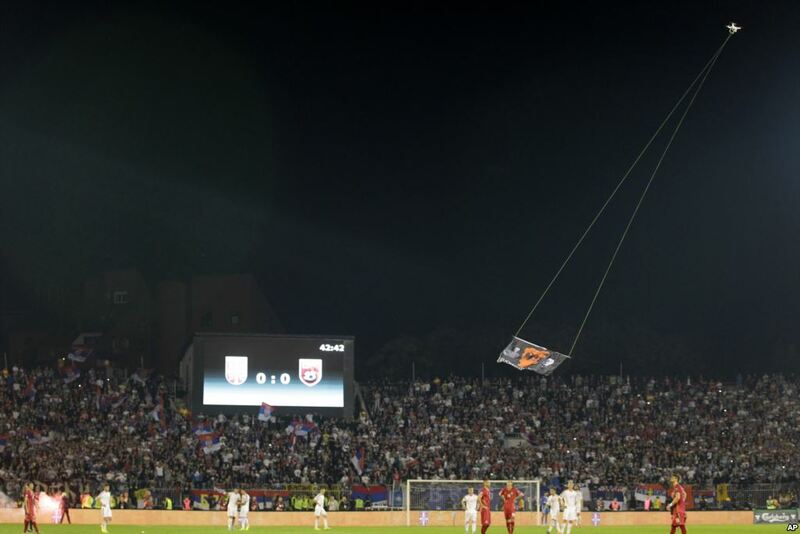 Not content to be totally blocked out of making a statement at the match, a covert Albanian fan flew a remote-controlled drone above the pitch and terraces with an Albanian-themed flag. But when Serbia’s Stefan Mitrović yanked down the flag, the powder keg was officially lit. Albanian players rushed over after taking offence to the action, a scuffle ensued and then Serbian fans began to rush the pitch to attack the Albanians. And after 30 minutes of delaying the match, English referee Martin Atkinson abandoned it. What repercussions, if any, will come of the event remain to be seen. But you do have to wonder how UEFA — who had prevented Spain and tiny Gibraltar from being drawn together in qualifying — could allow two countries with such deep political tensions to be drawn together. Next Post: you picked a WSOTP scarf, now pre-order it!